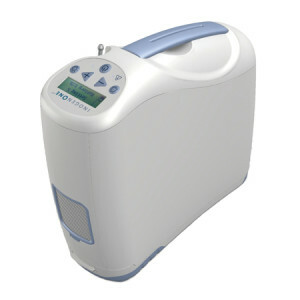 I’ve talked quite a bit about choosing the best portable oxygen concentrator. The most important factor is liter flow, followed by the size and weight. To assist you will making the best choice for your oxygen and mobility needs, here’s a handy chart for the most popular models on the market today. These portable oxygen concentrators are listed from lightest to heaviest. You’ll notice that increased weight allows for increased oxygen capacity. Can you tell me if the weight of these machines includes the battery? Yes, the weight provides includes the battery. For models that have an internal battery, the weight includes only the internal battery and not supplemental batteries. For the Inogen One G2 and G3, the weight given is with the smaller of the two batteries Inogen offers. For other models, the weight includes one standard battery (two in the case of the Oxlife). i see that in the above chart comparison the O2 delivery on pulse flow at 20 breaths per minute for maximum output in the ones i am interested in range from 84 to 192. how important is having a greater number as in 192 for the sequal eclipse 5 as compared to the invacare solo2 with 90. what is the real difference and or necessity for the greater number? The greater oxygen capacity of the SeQual Eclipse 5 is significant and necessary for people who have high oxygen needs. For people using up to setting 6, there is not much noticeable difference from one unit to another. However, for people who need even higher oxygen settings, the Eclipse offers output settings that are roughly equivalent to 7, 8 and 9. Hi. 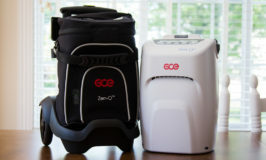 Is there a portable oxygen concentrator that I can use for traveling on the plane that can give me a continuous flow of 6L? Unfortunately, no. The highest amount of oxygen any portable concentrator will produce on continuous flow is 3 LPM. If you are able to use a pulse flow setting, I would recommend the SeQual Eclipse 5, which has pulse settings up to 9. Hello, is there a POC that I can use while traveling by train. I intend to have a bedroom on board for my husband and myself. I am currently using an Invacare with a continuous setting of 3.5 LPM while at home. When I am traveling by auto I have the pulse flow setting at 4 on a POC. It is my understanding that trains have electrical outlets in the sleepers. If you are able to use pulse flow, then you should be able to use your POC. If you need continuous flow then you may like the new Inogen At Home concentrator due on the market this fall. It provides up 5 LPM continuous and will be only 18 pounds. I need to travel by car from MS to Duke UM. I need 4 to 6L. What do you suggest O2 wise? Do you need continuous flow or can you use pulse. If continuous flow is needed, then unfortunately, there is not portable concentrator on the market that will provide continuous flow settings that high. The maximum flow a POC will provide on continuous flow is 3 LPM. If pulse can be used then the Inogen One G2 might work. Or for a more powerful unit (more oxygen per breath at the same pulse settings) I would recommend a SeQual Eclipse 5 or SeQual eQuinox. What is your understanding about how POC settings are calculated ? I know that the inbreath is generally much shorter than the outbreath so I’m guessing the setting ought to suggest an equivalency in O2 taken in more or less equal to continuous flow liters per minute., but nothing I’ve heard points one way or the other. Are there even common standards among manufacturers? I just bought the Inogen G3 because even though the capacity isn’t quite up to what I’d like, I think the effort to lug around a G2 might raise my requirements a setting or two. Do you think there might be some validity to my take on that? Most people can use the same pulse flow setting as continuous; however, there is no common standard among manufacturers. 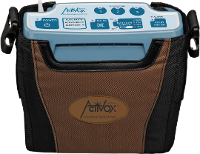 A Setting 2 is not the same for a LifeChoice Activox, an Inogen One G3, or a SeQual Eclipse (15 mL, 21 mL, and 32 mL per breath respectively at 20 breaths per minute). 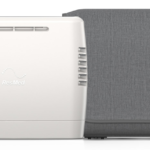 For an in-depth look at pulse settings, I recommend my article to you: A Guide to Understanding Pulse Flow Settings on Portable Oxygen Concentrators. Unfortunately, I am unable to answer your last question. Only you and your doctor can determine whether the heavier weight of the G2 would cause increased effort on your part and result in the need for a higher oxygen setting. What is the lightest weight and most quiet POC with continuous flow of 1 liter per minute ? Unfortunately, the lightest and quietest will not be found in the same machine. The lightest unit is the Philips SimplyGo. The quietest is the SeQual eQuinox. I can’t seem to find an Oxygo POC on any comparison lists, yet it seems very similar to the Inogen one g3. Do you know how they compare? The OxyGo is an Inogen One G3 that has been privately labeled for the dealer. As far as I know, it has not been modified and it will have the same specifications as the Inogen One G3. Do any of the portable continuous flow units start at 1/2 of a liter? I am on this 24/7. I use with a bi-pap at night. I am also interested in something light weight. Thank you. The Philips Respironics SimplyGo is the smallest unit available that has a continuous flow option. It has a 1/2 liter setting that would provide the oxygen you need, and it weighs 10 pounds.